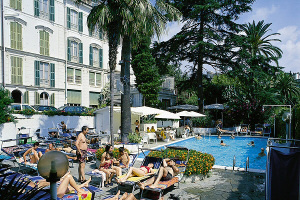 San Remo offers hotels suited to every visitor’s budget. The mild climate and palm tree gardens can be found even at the hotels that are economically priced. Specialists in hospitality, even the most modest hotels in San Remo are equipped and furnished with good taste, by professionals. Budget hotels have simple but welcoming rooms, and are often found not too far from the seafront and the main points of interests of the City of Flowers. Have a look at the following list of hotels, and you will find various types of accommodation, from hotels situated in the center to those far away from the crowds, from those that tend to be more modern to those that are more traditional. You will be able to find yourself spending a summer holiday beside a swimming pool at a very good price!